Despite his Marxist desire to have the government control all property, Bill de Blasio has easily won selection by the Democrat Party to run again on their ticket for Mayor of New York City. Property can be viewed as a way to store or bank the value of one's own labor. To claim that an individual has no right to the property that results from his labor is really just a way to deny ownership of one's own labor. If we do not own our own labor then we also do not own the time or the effort we devote to our labor. The very essence of living for the individual human being is the management of one's own activity including the most important activities of labor which provide us the means to maintain and secure our own life. Without the control of our own saved labor as property, we become subject to every vagary of life, including those of fickle government. Deprived of our stored labor in the form of property, every fickle decision by committed socialists such as Senator Bernie Sanders and Mayor Bill de Blasio has the potential to be one of whether each individual will live or die. To give them this power is to forfeit all individual control over our lives, making each and every individual a slave to their whims. What difference does it make? 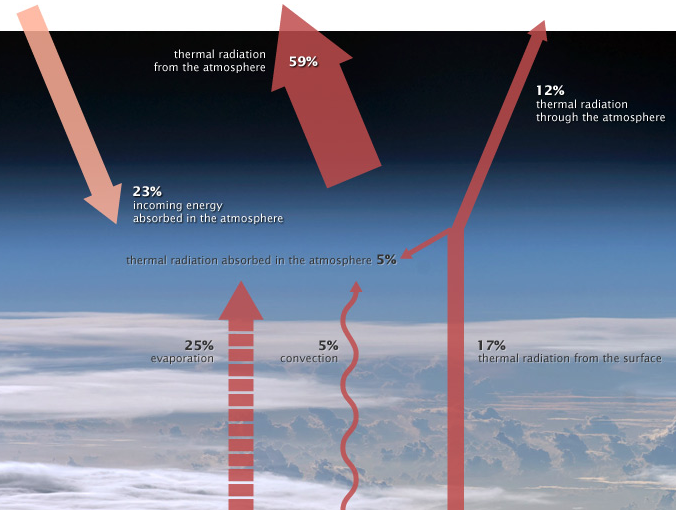 Who cares whether the atmosphere absorbs 29% or 90% of the infrared radiation from the Earth's surface? Apparently NASA doesn't care, despite the fact that the settled science claims that atmospheric absorption of this radiation is key to the catastrophic greenhouse effect. Note that the surface is here emitting thermal radiation with an power equal to 17% of the solar insolation at the top of the atmosphere up into the atmosphere. Of that 17%, 5% is absorbed by the atmosphere on passage and 12% makes it through the atmosphere into space. Therefore 5/17 = 0.29 or 29% of the surface emitted longwave radiation is absorbed by the atmosphere. This warms the atmosphere and it retards the rate of radiative cooling of the surface. This is the very essence of the so-called greenhouse effect. That effect is a critical scientific issue and one that the so-called settled science claims to understand well as the basis of its call for drastic action to prevent catastrophic man-made global warming. Now the Earth's surface radiation has swollen by 100% to 117% and only 12% makes it out of the atmosphere into space. Now the atmosphere absorbs (117% - 12%) / 117% = 0.90 or 90% of the longwave infrared thermal radiation emitted by the Earth's surface. It is much easier to make a claim that man's emissions of CO2 into the atmosphere will have dire consequences when you can present a picture of 90% surface radiation absorption in the atmosphere than when you present it as 29% absorption. Note that the story for catastrophic man-made global warming is also made to seem more plausible because surface thermal radiation at 117% just overwhelms the rates of energy loss due to water evaporation at 25% and convection at 5%. If surface radiation is just 17%, then 25% + 5% = 30% is a lot more important. As I have pointed out in other postings, the loss of the majority the Earth's surface heat by non-radiative means is critically important in establishing a warm surface temperature. So which is it? 29% or three times more at 90%? What is actually measured is the rate at which energy is transferred from the surface to the atmosphere and beyond. Note that in the Earth energy budget schematic, the back radiation from the atmosphere is claimed to be 100%. If you subtract that from the 117% that diagram says is emitted from the surface, you get a net surface emission of 17%. In this way, NASA believes the Earth Energy Budget diagram and the upper diagram of the atmospheric absorption are equivalent, but the lower diagram sure represents greenhouse effects as more important than does the upper diagram. What is actually measured? When you make a measurement of the radiation from the surface from a given altitude, you only know the radiation power transferred from the surface to your measuring instrument. Suppose your measuring instrument is at the same temperature as the atmosphere at that altitude. It can then only measure the energy that can be exchanged between two bodies at the respective temperatures. In other words, the 5% of surface radiation absorbed by the atmosphere would be what your meter would read at the appropriate point in the atmosphere. If you move your meter outside the atmosphere into space and have it at the appropriate space temperature, then it can read the 12% level of radiation that escaped into space. What you really know is presumably what is in the upper diagram. So how does NASA generate the lower diagram with the 117% surface thermal radiation and the 100% back radiation? It does so by means of the hypothesis that the atmosphere is a black body radiator, as is the surface. Both radiate energy exactly as they would if they were isolated black bodies surrounded only by space at a temperature of absolute zero. What is more, they suppose that any body (greenhouse gases mostly) in the atmosphere absorbing surface radiation re-emits it only toward the Earth's warmer surface, none of that is absorbed by other greenhouse gases, and all of it is incident upon the Earth's surface, which then absorbs 100% of that radiation. This is absolutely wrong. The exchange of thermal radiation energy occurs through the medium of an electric field and the flow of photons is only as required by the electric field gradient from the warmer to the cooler body. The 100% thermal radiation from the atmosphere to the Earth's surface is a figment of NASA's imagination. In the NASA upper diagram of the atmosphere and the power held in it, the sum of that power is 23% + 25% + 5% + 5% = 58%. In the NASA Earth Energy Budget lower diagram, the atmosphere has an absorbed power of 23% + 5% + 25% + (117% - 12%) = 158%. Now it is a miracle that the atmosphere can hold more power than the sun is supplying as is claimed in the NASA Earth Energy Budget in the first place, but faith in the authority of the settled science requires us to believe this. The upper diagram, which is much closer to the actual measurements made, does not require us to violate the Conservation of Energy. Does this not prompt the rational observer to believe that the assumptions made to generate the NASA Earth Energy Budget are wrong? The atmosphere on average is colder than the Earth's surface. 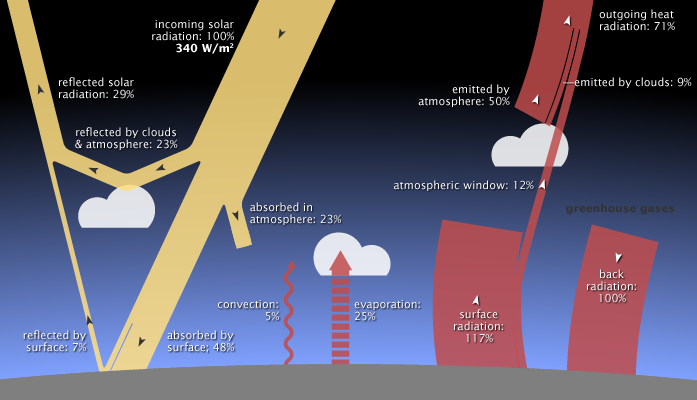 In the upper schematic, the atmosphere radiates 59% of the solar insolation at the top of the atmosphere out into space. The atmosphere is warmer in general than is space so this is what we expect both thermodynamically and as a means to conserve energy. In the NASA Earth Energy Budget, the atmosphere radiates 100% power to the Earth's surface, which absorbs it all, and it only radiates a power of 59% into space. Consequently, the atmosphere is treated as a black body radiator that radiates with a total power of 159% in the NASA Earth Energy Budget schematic. This violates energy conservation. It implies that a molecular gas thermal radiator emits radiation anisotropically, which is contrary to their own statements and viewpoint that bodies emit thermal radiation as though they were isolated in vacuum with a temperature of absolute zero. They assume that the anisotropic emission heavily prefers emission from a cooler gas molecule to the warmer surface of the Earth, rather than to a much colder space. In reality, the thermal radiation power absorbed by the infrared-active gases called greenhouse gases is emitted anisotropically, but such that it flows to colder bodies or to cold space. The real world cares whether the atmosphere is absorbing 29% or 90% of the Earth's thermal radiation. Indeed, those who make infrared sensing devices care also. If the atmosphere really did absorb 90% of radiation emitted by bodies at a temperature of 288 K, then it would be much harder to make and use infrared sensors for imaging and for temperature measurements. Fortunately, the 8 to 14 micrometer wavelength portion of the infrared spectrum is much more than 10% of the emission spectrum for black bodies with temperatures near 288 K all by itself. This part of the spectrum lies in one of the atmospheric windows in which water vapor and carbon dioxide absorb almost nothing. See my recent post on how infrared thermometers use this portion of the infrared spectrum to measure temperatures of gray body thermal emitters and how the atmosphere is no gray body. It is very clear from the arguments made there that the claim that the atmosphere absorbs 90% of the Earth's thermal radiation at 288 K is nonsense. It is the 29% absorption value that makes sense. The settled science behind Climate Change is full of inconsistencies and violations of science of such a simply understood nature that it is a farce. Catastrophic man-made global warming is based in a religion and politics, not in science. This is why its alarmist proponents get so upset when someone, especially a scientist, does not share their unquestioning faith. Faith is everything for this belief. Do Infrared Thermometer Sky Temperature Measurements Prove Greenhouse Gas Back Radiation? The atmosphere is why the Earth is warm enough to support life, for it contains water vapor, a gas that strongly absorbs infrared radiation. This water vapor is the key to why the Earth is warm enough to support life. According to the National Oceanic and Atmospheric Administration, removing water vapor from the atmosphere would reduce the average temperature of Earth to 0 degrees F! The oceans would be frozen solid. You can use an infrared thermometer to see the impact of water vapor on warming the atmosphere. The temperature in outer space approaches absolute zero, which is -273 degrees Celsius. But you will measure a much warmer temperature if you point an infrared thermometer at the sky directly overhead (the zenith). Depending on the season and your location, the temperature will likely be near or below zero degrees Celsius. While this is very chilly, it’s far from being as cold as absolute zero. The difference is caused mainly by water vapor in the sky that has become warm by absorbing infrared radiation emitted by the Earth below. The warmed water vapor returns some of the infrared back to the Earth, and this helps keep the Earth warmer than space. Now it is true that without water vapor, the average temperature of the Earth would be below freezing or 0⁰C = 273.15 Kelvin (K). It is true that water vapor lies behind the fact that the Earth experiences relatively mild day to night decreases in temperature as well. It is commonly the case that one can point an infrared thermometer at the sky and read a temperature which is much closer to 0⁰C than close 0 K or -273.15⁰C. However, there are several common misconceptions that people, including scientists, have about what this means. One of the popular misconceptions is that the inexpensive and common infrared thermometer pointed straight up into the sky is reading a temperature based on infrared radiation absorbed by water vapor, which is then re-emitted back to the surface of the Earth where it is re-absorbed and warms the surface. The reading of the infrared thermometer is taken as evidence that water vapor, and to a lesser degree other greenhouse gases, are back radiating infrared energy to the surface as the above NASA website claims. I will evaluate this assertion about what the infrared thermometer reading is actually telling us later. One of the claims of greenhouse and global warming theory that many people find hard to grasp is that there is a large flow of infrared radiation downward from the sky which keeps the surface warmer than it would otherwise be. Particularly difficult to grasp is the concept of adding a greenhouse gas to a COLD atmosphere, and that causing a temperature increase at the surface of the Earth, which is already WARM. This, of course, is what is expected to happen from adding more carbon dioxide to the atmosphere: “global warming”. Well, it is one of the marvels of our electronic age that you can buy a very sensitive handheld IR thermometer for only $50 and observe the effect for yourself. These devices use a thermopile, which is an electronic component that measures a voltage which is proportional to the temperature difference across the thermopile. If you point the device at something hot, the higher-intensity IR radiation heats up the hot-viewing side of the thermopile, and the IR thermometer displays the temperature it is radiating at (assuming some emissivity…my inexpensive unit is fixed at e=0.95). If you instead point it at the cold sky, the sky-viewing side of the thermopile loses IR radiation, cooling it to a lower temperature than the inside of the thermopile. The IR thermometer was measuring different strengths of the greenhouse effect, by definition the warming of a surface by downward IR emission by greenhouse gases in the sky. This reduces the rate of cooling of the Earth’s surface (and lower atmosphere) to space, and makes the surface warmer than it otherwise would be. Greenhouse gases, more properly, infrared-active gases, and very much primarily water vapor, cause the Earth to be warmer than it would be without them by causing the Earth’s surface to emit less thermal radiation in the form of infrared radiation to space. This is not the same as saying that they emit infrared back to the Earth’s surface where it is absorbed and warms the Earth’s surface, as most scientists mistakenly believe. It is also commonly assumed that because the Earth’s surface is warmer because it has infrared-active gases, that the addition of further infrared-active gases in the atmosphere will further warm the Earth. In fact, the infrared-active gases have both warming and cooling mechanisms. The warming mechanisms are nearly saturated effects at present atmospheric concentrations, while the cooling mechanisms generally do not saturate, so additions of these molecules to the atmosphere provides cooling mechanisms that more and more compete favorably with the warming mechanisms. So the fact that at present concentrations the most important infrared-active gases have caused a net warming effect does not tell us what the effect of higher concentrations of these gases in the atmosphere will be. In most places, higher daytime relative humidity actually causes cooling. If the greenhouse effect were a slowing of the cooling of the Earth’s surface due to decreased surface infrared emission, then there is a greenhouse effect, though of rapidly diminishing effect upon adding those gases whose warming effects are largely saturated. But if the definition is as Dr. Roy Spencer makes it, namely that downward infrared emission from the atmosphere by water vapor is the cause, there is no greenhouse effect. I am not here going to concentrate on the proof of this statement I have just made. I am going to prove that the common and inexpensive infrared thermometers that Dr. Roy Spencer and the above NASA website refer to do not at all prove that water vapor is absorbing infrared thermal radiation from the surface to diminish the rate at which the surface loses energy by means of thermal radiation. I will show that the infrared thermometer readings of a warmer sky temperature than one near absolute zero do not prove the existence of back radiation from anything. What they prove is the absorption of radiation by objects colder than the surface and the emission of radiation from sparse matter which is warmer than the surface of the Earth. where σ = 5.6697 x 10-8 W/m2K4 is the Stefan-Boltzmann constant. This black body radiation consists of a distribution of wavelengths, whose peak energy wavelength shifts to longer wavelength as the temperature drops. See Fig. 1. Below. Fig. 1. 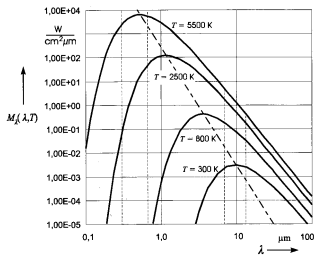 Black body thermal radiation as a function of temperature and wavelength is plotted above. The Earth’s surface temperature is about 288 K. The temperature of the outer surface of the sun is about 5800 K.
P = ε σ T4. This adjustment is not always adequate for real materials, however. For instance, some materials such as gray iron do not have a constant emissivity with temperature. In fact, it is not unusual for the emissivity of a metal to decrease as the temperature drops, while non-metallic materials often do the reverse. Plastics and organic materials have strong variations in their absorptivity and emissivity with wavelength, making them very unlike either black bodies or gray bodies. Fig. 2. 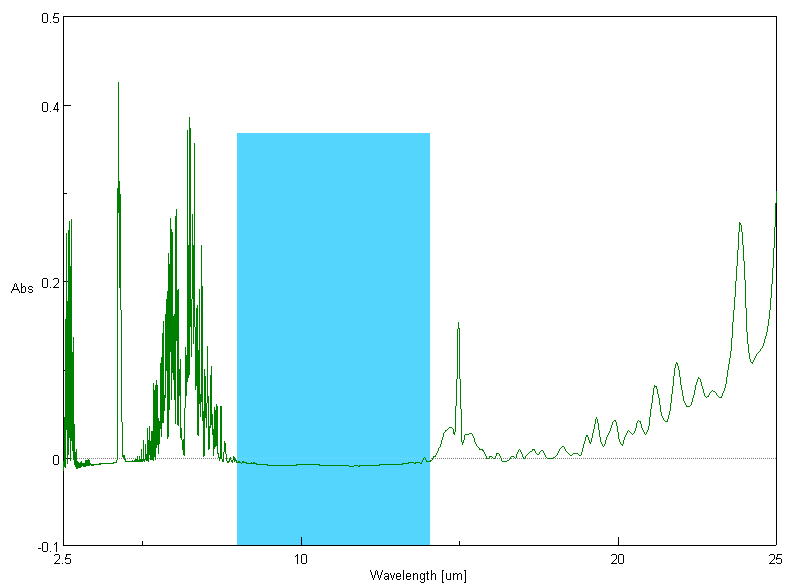 The infrared absorption spectra are shown for the non-gray body materials from top to bottom of a) rich, moist soil, b) sand, c) green leaf from a bush, and d) water. 4000 cm-1 is 2.5 μm and 400 cm-1 is 25 μm wavelength. The thermal emission as a function of temperature is the same as the thermal absorptivity and these are clearly all highly unlike the emission curves for black bodies or gray bodies. where α is the absorptivity of the cooler body. If the cooler body were a black body, then α = 1, but usually 0 < α < 1 for real materials. Since infrared thermometers are most often used to measure the temperature of bodies warmer than the meter, the absorptivity is usually a fixed property of the meter itself, but this is not the case when it is used to measure the temperature of a cooler body. The Fluke 568 Infrared Thermometer that I use in my laboratory measures temperatures from -40⁰C to 800⁰C (233 K to 1073 K). So, if one knows the temperature of the backside of the thermopile of the infrared thermometer facing the object whose temperature one wants to read and one knows the value of P in the above equation, one can determine the temperature of the object the instrument is focused on. Ideally, the side of the infrared thermometer thermopile facing a warmer object will warm up due to the transfer of energy at the rate given by P in the power exchange formula above. If the object temperature is cooler, the side of the thermopile facing the object will cool down as infrared radiation is emitted from that side of the thermopile and absorbed by the cooler object. The thermopile develops a potential difference across it due to the temperature difference and this yields a measured voltage. The measured voltage and knowledge of the temperature at the backside of the thermopile would allow a determination of the object temperature. However, this is not how infrared thermometer instruments work for many practical reasons. The straightforward use of this total power transfer equation to make a temperature measurement is frustrated by the infrared transmission properties of the infrared focusing lenses, by the absorption of radiation emitted by the warmer object by water vapor and carbon dioxide in the air, and even by the absorption properties of the thermopile sensing material. No lens material transmits all of the radiation wavelengths without absorption in the spectrum emitted from the warmer body. The absorption will also vary with wavelength. These wavelengths may range through the entire infrared spectrum and include red visible light for an object at 800⁰C, which is the top of the temperature range of my Fluke 568 infrared thermometer. Actually, there is even a bit of microwave radiation in the tail of the spectrum, though there is little energy in that very longwave radiation. Consequently, the radiation from a warmer external body is obstructed in varying degrees by the lens material from warming the object-facing side of the thermopile. If the external object is cooler, then the lens material decreases the amount of radiation transferred from the object-facing side of the thermopile to the cooler external object. Now of great importance to the meaning of infrared thermometer readings of the temperature of the atmosphere, we will consider why the market for infrared thermometers demands that certain parts of the infrared wavelength spectrum not be used. These instruments were developed to address the need to make temperature measurements at a distance, to make them quickly, and to make them of moving objects such as those on a conveyor belt in a production process. One does not want the accuracy of the measurement to be decreased by variations in the relative humidity or even in the local carbon dioxide concentrations. Carbon dioxide may go up due to nearby combustion processes or due to calcining concrete or due to having many people in an enclosed area. Consequently, one wants to exclude the infrared wavelengths which atmospheric water vapor and carbon dioxide absorb. The infrared wavelengths absorbed by water vapor and carbon dioxide are shown in the Fig. 3. Fig. 3. 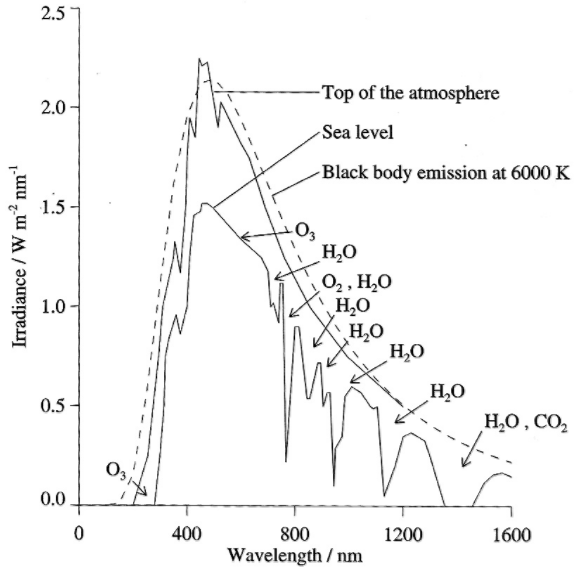 The infrared absorption spectrum at 65% RH and a much elevated CO2 concentration after subtracting the background due to about 40% RH and normal atmospheric CO2 concentration is shown above. This spectrum was acquired by me using my FTIR spectrometer in the Anderson Materials Evaluation, Inc. laboratory. Most of the absorption is due to water vapor with carbon dioxide absorbing the relatively narrow lines at about 4 and 15 micrometers wavelength. Some of the absorption at 15 micrometers is also due to water vapor. Note that neither water vapor nor carbon dioxide absorb, and therefore emit, thermal radiation as a gray body would. The blue area is the range from 8 to 14 micrometer wavelength which lies in the atmospheric window where water vapor and carbon dioxide do not absorb infrared radiation significantly. Most general purpose and relatively inexpensive infrared thermometers use only this 8 to 14 micrometers (microns) wavelength for temperature measurements in order to keep water vapor and carbon dioxide absorption from creating errors in the measurement. The Fluke 568 infrared thermometer is among those using this wavelength range for its temperature measurements. So, the market that makes these infrared thermometers available demands that they not measure infrared radiation absorbed by either water vapor or carbon dioxide. Only the infrared range from 8 to 14 micrometers is used in most infrared thermometers. This is the blue region in Fig. 3 and it is the region in Fig. 1 near 10 micrometers (μm) indicated by the vertical dashed lines on either side of 10 μm. Note that the wavelength axis of Fig. 1 is logarithmic, while the wavelength axis of Fig. 3 is linear. Only that part of the power transferred from a warmer to a cooler body that is between 8 and 14 μm is then used to determine the temperature of the object in these common infrared thermometers. It is also important to note that the instrument maker has assumed that the heat emitting and heat absorbing materials behave like gray bodies. Yet when one points these instruments at the sky, they do measure something. Here are some measurements I recently made pointing a Fluke 568 instrument vertically up at the sky from a grassy area on the other side of the parking area in front of my laboratory, of the grass at my feet, the woods just beyond the grassy area, and the asphalt of the parking area. When pointing the instrument at a cloud, the temperatures measured are commonly above zero Centigrade. The most important single cooling mechanism for the Earth’s surface is the evaporation of water. As water vapor is carried upward in warm air currents, it cools as the air cools with increasing altitude. This cooling is because the air temperature is proportional to the kinetic energy of its molecules and that decreases as the molecules potential energy in the Earth’s gravitational field increases. At a sufficiently high altitude, commonly about 2,000 to 4,000 meters if there is enough dust, aerosol, or ions present for the water vapor to condense on, condensation of the water vapor occurs and considerable heat of condensation is released. This in turn makes the clouds that are formed relative warm spots in the atmosphere. This accounts for the relatively warm sky temperature measurements of 1 and 2 September above. These measurements are essentially of the cloud temperature at its bottom surface. Fig. 4. The absorption spectrum of water acquired on my FTIR-ATR at Anderson Materials Evaluation, Inc. is shown here. Note that liquid water is not itself a gray body absorber of infrared radiation between 2.5 and 25 micrometers wavelength. There is some absorption in the range of wavelengths from 8 to 14 μm, however. A critical part of the reason for clouds absorbing infrared in this range like gray bodies is that the many small water droplets scatter the light within the cloud so much that what is not absorbed by one droplet is absorbed the nth time it scatters from other droplets of water. Now note that under clear sky conditions, the vertical temperature measurements of the sky using the Fluke 568 infrared thermometer instrument were between -21.9 and -39.9⁰C. The lower limit on this instrument for an accurate temperature measurement is -40⁰C, so the lowest reading obtained was at this limit. [Readings taken since this posting have been as low as -47.7⁰C, indicating faster rates of surface cooling by radiation. The lowest temperature reading was made with a relative humidity of 64%, consistent with water vapor playing no significant part in the absorption of radiation in the 8 to 14 micron wavelength region of the infrared spectrum. While the cooling rate of the thermopile was no doubt greater with a reading of -47.7⁰C than with one of -39.9⁰C, because this is beyond the accurate limits of the meter, the temperature read would not be that of a suitable radiation absorber and surely is not one that corresponds to any object in the sky. We do not know what instrument artifacts are introduced into this reading either.] [The lowest sky reading to date was -50.0⁰C and some readings would not register at all, meaning the meter saw the sky as below that temperature.] But why were some of the readings slightly higher. One reason may be that the humidity was substantial and while the 8 to 14 μm range does not detect the transfer of energy from the meter’s thermopile side facing the cold sky to water vapor, there may be small pockets of atmosphere with a bit of water droplet formation occurring which is not sufficient to appear as a cloud by eye. The very coldest measurement made was made between two wispy and thin cloudy areas. There are surely areas with lower densities of droplets that one does not see and then there would be a small amount of energy transfer from the instrument thermopile to those few water droplets. This would contribute to a temperature reading. There is another factor which is definitely at work here. While ozone is not much of a factor in the lower atmosphere designated as the troposphere where the temperature drops nearly linearly with altitude, ozone is much more of a factor in the stratosphere. The troposphere ends at about 11 km altitude in the US Standard Atmosphere of 1976, where the tropopause has a temperature of about 217 K. The stratosphere begins at an altitude of about 21 km and the temperature rises to about 271 K at 50 km altitude. Above the stratosphere, the temperature then drops again to about 188 K at 95 km altitude, before it increases once again to reach about 1000 K at 800 km. The layer of the atmosphere with the highest concentrations of ozone is that from about 20 to 30 km altitude, where the temperature ranges from 217 to 227 K, but there is also ozone at higher altitudes in the stratosphere and beyond where the temperature is higher. The concentration of ozone relative to other gases is not more than about 10 parts per million (ppm), but this is enough that ozone, O3, absorbs most of the ultraviolet light in the solar insolation of the Earth. See Fig. 5. below. Fig. 5. The strong absorption of ozone, O3, of incoming solar radiation (solar insolation) is shown above. It absorbs ultraviolet light strongly and some visible light as well. So the question is whether it can play a significant role also in the absorption of energy emitted from an infrared thermometer pointed straight up at the sky on a clear day. The absorption spectrum is provided in Fig. 6. below. Fig. 6. 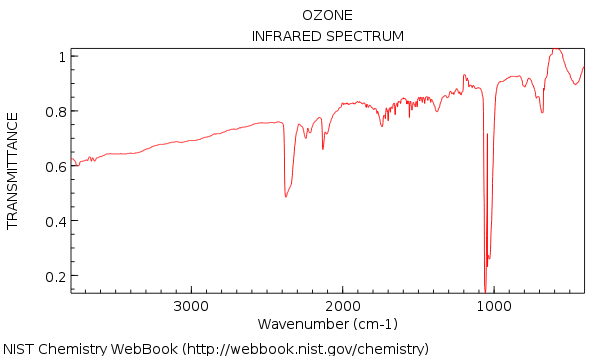 The infrared absorption spectrum of ozone, O3, is shown above. The 8 μm wavelength is the same as 1250 cm-1 in the spectrum above and 14 μm wavelength is the same as 714 cm-1 in this spectrum. The major absorption peak at about 1050 cm-1 as shown is at about 9.5 μm wavelength. Consequently, ozone absorbs strongly within the atmospheric window of 8 to 14 μm, though it does not do so strongly at all wavelengths within that window. Yet there is some absorption throughout that range. So, we see that ozone does absorb infrared radiation within the 8 to 14 μm atmospheric window. What is more, while the most concentrated layer of the ozone is in the cooler stratosphere from about 217 to 227 K (-56 to -46⁰C), there is also ozone above that layer in the stratosphere where the temperature can get up to 271 K or -2⁰C. There is even a bit at 800 km altitude where the temperature is 1000 K. There is also about 0.3 ppm of ozone in the troposphere with its higher temperatures. So, it is quite reasonable to believe that ozone absorption accounts for some part of a -39.9 K temperature reading when one points an infrared thermometer vertically upward at the sky on a clear day. This ozone absorption effect is not significant for the kinds of measurements that these infrared thermometers are designed to make near the surface of the Earth. Above the tropopause, in the stratosphere and above, the equation of state of the gases in the atmosphere undergoes a significant change relative to the near compliance with the ideal gas law in the troposphere. I have long believed that bound water and carbon dioxide molecules might be brought together by ionization processes to form trimers and tetramers in the stratosphere. It is common for water and CO2 to be absorbed together between the layers of lamellar or layered materials, so they seem to have an affinity under the right circumstances. Recently, Dr. Michael Connolly and Dr. Ronan Connolly posted a paper on a website suggesting that trimers and tetramers might even exist of oxygen and nitrogen molecules. These more complex molecular structures might explain a change in the equation of state of the gases and would have more infrared absorption lines due to their more complex internal vibrational states. They may therefore add to the absorptions in the atmospheric window between 8 and 14 micrometers. There are also other contributors to the implied absorption of infrared radiation emitted by the lens facing side of the thermopile in this instrument. Dust, aerosols, and smog in the atmosphere can also absorb some of that energy. In fact, absorbing dust does not even have to be in what we usually consider the atmosphere of the Earth. It can be out there in space. Now some of this dust will be at very low temperatures if it is far from our sun, but much of the dust within a few times the Earth’s orbital radius around the sun can be much warmer due to solar insolation absorbed by that dust. This dust diminishes the flow of heat from the lens side of the thermopile out to space, making the instrument read a higher temperature than that of space as a whole. Fig. 7. NASA Earth Energy Budget with most of the surface thermal radiation returned to the surface by a highly efficient absorbing atmosphere. In this NASA Earth Energy Budget, 85.5% of the thermal radiation from the surface of the Earth is absorbed in the atmosphere and returned to the surface. By some means of magic, whatever bodies absorb this radiation fail to re-radiate it to colder parts of the atmosphere preferentially or even to radiate half of that absorbed energy to colder regions or to space. No, the re-radiated heat is radiated most strongly to the higher temperature Earth's surface with a strong prejudice against radiation to colder bodies or to space. This is already insane physics if the absorbing bodies are in the troposphere, but it is even more insane when a very substantial portion of the infrared spectrum absorbs very little radiation anywhere in the Earth's atmosphere and what it does absorb is absorbed mostly above the troposphere. Remember that the temperature read by the infrared thermometer is based on the assumption that the body whose temperature is read is a gray body absorber or emitter. The absorbing bodies in the atmosphere are generally not gray body absorbers, so the temperature read is not the actual temperature of the infrared absorbing bodies or even a weighted average over the many absorbing bodies. There is further error in that some small fraction of the energy comes from warmer bodies. Another point to be made about infrared thermometers is that they do not replicate the actual energy loss rate by means of thermal radiation from the surface of the Earth. The Earth’s surface loses more energy by the combined means of water evaporation and thermals or convection currents than it does by means of thermal radiation. The sensor or thermopile of an infrared thermometer is isolated from the effects of these other energy loss mechanisms. It is not cooled by the evaporation of water and is kept dry. It is also tightly enclosed so that convection currents do not carry heat away from it. Either of these loss mechanisms would badly interfere with the function of the infrared thermometer in reading the temperatures of bodies at which it is pointed. Infrared thermometers reading temperatures when pointed vertically upward at the sky are measuring only a net rate of energy loss to the sky and do not provide any evidence for back radiation. Infrared thermometers commonly measure only infrared radiation in the atmospheric window, most commonly that in the wavelength range 8 to 14 μm. Water vapor and carbon dioxide do not absorb or emit infrared radiation in this wavelength range in the atmospheric window. Consequently, the vertical measurement of a temperature from the sky does not provide evidence for the absorption of the Earth’s surface infrared emissions by water vapor or carbon dioxide at all. Clouds certainly do reduce the nighttime rate of loss of energy from the surface, though they commonly cause a net cooling of the surface during the day. Ozone, dust, smog, and aerosols all likely contribute to a reduction of the loss of power from the instrument thermopile by means of radiation as long as they are warmer than the far reaches of space. There is plenty of material that is much warmer than far space. Material at a hotter temperature than the thermopile lens facing side can add photons from warmer emitters in the upper atmosphere and in the inner solar system. But the great majority of the material with which energy is radiatively exchanged is clearly colder than the instrument thermopile lens-facing side. The rate of energy loss from an infrared thermometer does not actually replicate the rate of loss of thermal energy from the Earth’s surface since water does not evaporate from the sensor and the sensor is isolated so that convection currents do not affect it either. These alternative loss mechanisms at the Earth's surface decrease the Earth's surface thermal radiation emissions. It makes no sense to believe that thermal radiation emitted from the Earth's surface can be absorbed by the atmosphere and returned to the Earth's surface and absorbed by it with 85.5% efficiency. This is particularly hard to believe when we realize that most of the small fraction of the absorption of the Earth's thermal radiation in the 8 to 14 micrometer wavelength range is absorbed in the stratosphere and beyond. Even in the wrongheaded physics common to the alarmists, it is often stated that infra-red radiators re-radiate the energy they absorb isotropically (evenly in all directions), rather than preferentially in the direction of a warmer body. In fact, they radiate their energy in the direction of cooler bodies, not even isotropically. If they did radiate isotropically, about half the radiation they absorb would be emitted to space and about half would be emitted back toward the surface. In NASA science, the so-called settled science, 85.5% of the total Earth surface thermal radiation is both absorbed by the atmosphere and preferentially radiated back to the Earth's surface. It's a miracle, plausible only to those with unbounded faith. NASA and Dr. Roy Spencer are wrong to tell us that inexpensive and common infrared thermometer readings of vertical sky temperatures prove that water vapor warms the Earth. Dr. Roy Spencer is wrong in asserting that they prove that water vapor back radiates infrared photons that are absorbed by the Earth’s surface to warm it. I will repeat that water vapor does provide the Earth with a substantially warmer surface temperature than it would have without water vapor. The way and the degree to which it does so is not understood properly by the so-called settled science. See my discussion of how it does this in WaterVapor and Gravity Act Together to Warm the Earth. Oftentimes, NASA does not think basic climate science through. This is another example of how it stumbles with basic science. How much is government incompetence and how much is simply propaganda to further expand the already highly excessive powers of government is hard to say and differs greatly among the proponents of catastrophic man-made global warming. Dr. Roy Spencer has done much good climate science work and is a more reasonable Lukewarmer, but I must take him to task on some arguments for the effects of water vapor and carbon dioxide here as well. Additions made through the morning of 11 September are in this green color. Addition made on 29 October 2017 is in this color. Additions made on 31 October 2017 are in this color.